Fennel is looking good in the shops at the moment, and I love the fresh aniseedy flavour. I also had some lovely little potatoes and a bunch of dill so it had to be potato salad for work lunches! 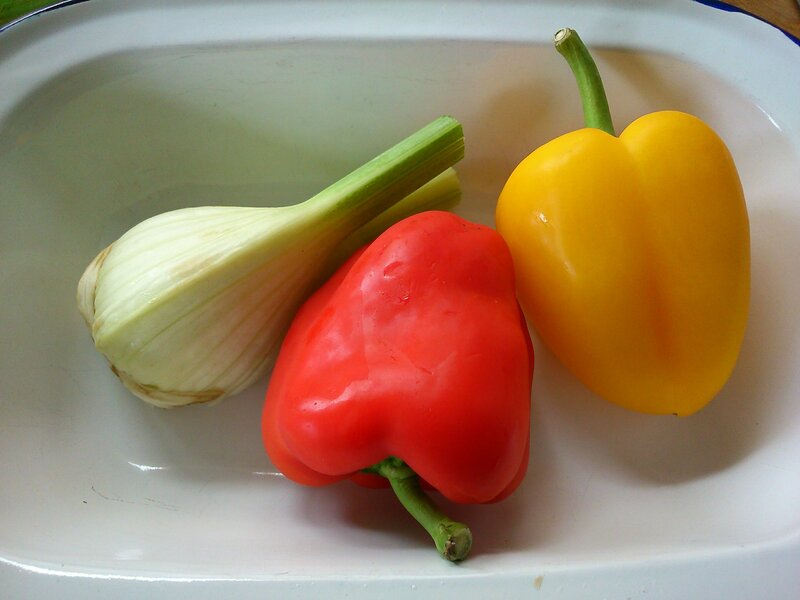 Here I’ve roasted some of the fennel, along with red and yellow peppers, to add a little sweetness as a counterpoint to the fresh crunchy raw fennel. Along with kidney beans to make the salad more sustaining, it made a great lunch today. Cooking the kidney beans with the potatoes for a couple of minutes does mean they don’t look as pretty in the finished salad, but as they’re softened they soak up the dressing really nicely! Cut off 2/3 of the fennel bulb, drizzle with a little oil and place in a small roasting tin. Set aside the other 1/3. Add the peppers to the tin, they don’t need any oil. Roast for 40 minutes, turning the peppers halfway through. The skins should be a bit wrinkly. Carefully transfer the peppers to a bowl and cover with cling film. This will allow the steam created by the residual heat to loosen the skins. Leave the fennel to cool. 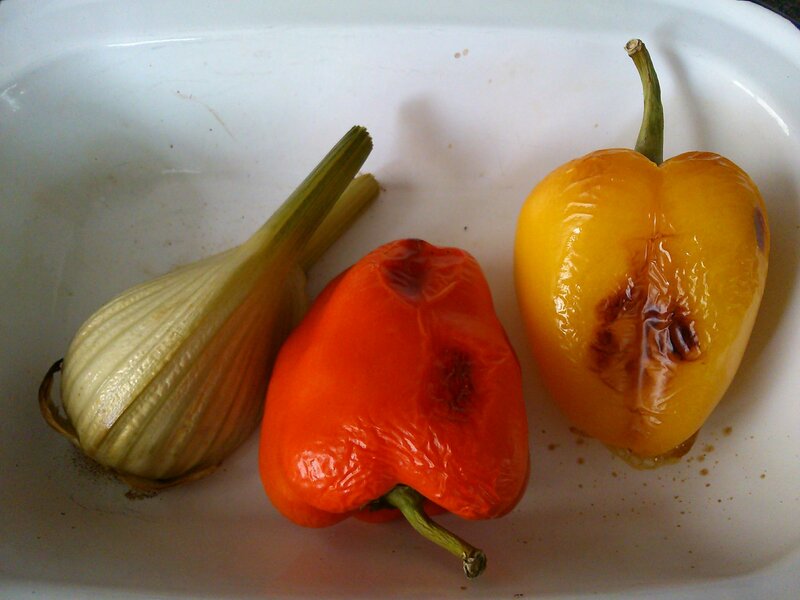 After 20 minutes or so the skins of the peppers should have loosened and they will be cool enough to handle. Peel the skins from the peppers and remove the central core. 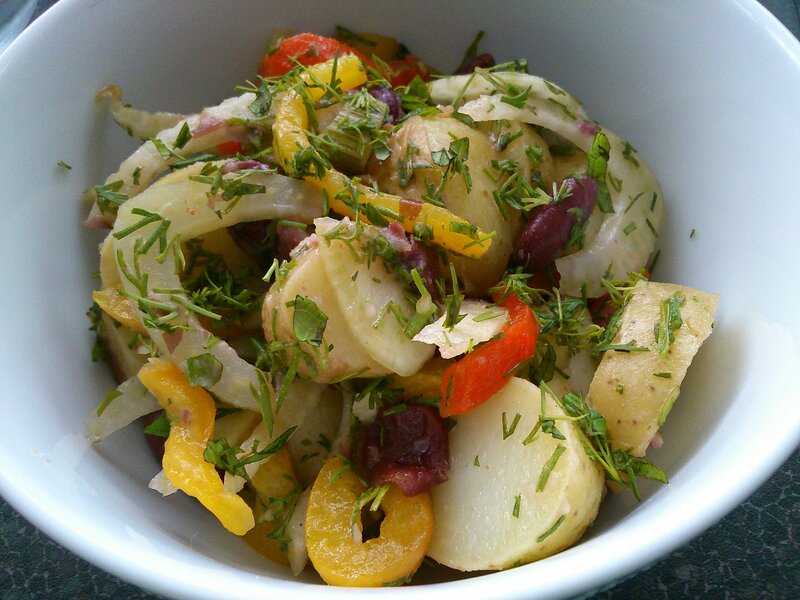 Slice the roast fennel, raw fennel and peppers into thin strips. While the vegetables are roasting, bring a large pan of water to the boil, add the potato and cook until until just starting to soften, mine took 8 minutes. Then add the kidney beans and bring back to a simmer. Lastly add the peas and again bring back to a simmer. Drain, and run under cold water for a minute or so. This is just to cool the potatoes a little and stop the cooking process, they don’t need to be cold. Put the potato mix back into the saucepan. Whisk the vinegar, oil, cardamom and salt and pepper together and pour into the saucepan. Mix everything together well and leave to cool. Gently toss the fennels, peppers and herbs through the potato mix. Love the addition of fennel in this recipe. Looks great!